This years’ CSW (59th in a row) was represented by revisiting and celebrating The Beijing Declaration and Platform for Action (BPfA) what without any doubt influenced the framing of the whole conference in the context of «20 years after the Beijing.» Just to remind ourselves quickly the Beijing Declaration was the «can do» result of advocates for women’s rights from around the world who came together to network and lobby «to develop a framework of comprehensive commitments promising to change the lives of women and girls everywhere», as it is underlined in the UN’s Introduction in Handbook 2015. The motto of the conference «Where women and girls shape the future» sounded suspicious to me – quite the same with the wishful thinking list of the SDGs – from the moment I have started attending the CSW’s sessions. So, what seems to be the problem with the whole UN thing? Readings in the line of Eisenstein’s, Federici’s or Fraser’s critique of UN as a not much of a woman-friendly institution serve us almost as an ABC of the serious analysis of the relation between neoliberalism and feminism, or to be more concrete in the field of systemic analysis which hits the question how does contemporary feminism aid and abet the strength of free-market capitalism? Hence, one of the most important issues for today’s feminism should involve the questions how does global corporate capitalism function today and what is the meaning of women’s position in the relation between capitalist political economy and green economy agenda. Everything about the CSW gave the impression of addressing the problems of «sustainable future», «global solidarity», «right to be different», «poverty», «health» etc. but one could just explode because of the discussion’s reduction to a merely nominal level without any materialist or systemic analysis of the cases. It all reminded me of a burgeoning literature on globalisation rarely focused on the centrality of women’s labour. For an example many panels numbered questions dealing with the problems indigenous women face – from existential and cultural level to social, economic, environmental and political. All was there – race, gender, sexual orientation, ability, religion but class section was desperately missing. In the line of a typical liberal-reductionist approach the Conference managed to affirm the ad-on strategy by listing picked-up problems in all-inclusive-manner (I mean no one «normal» would disagree with SDG-s for instance, but besides Rosa Luxemburg Stiftung’s panels any degree of «how» to actually use the goals was not present at the Conference as if it was not even intentioned to work on their implementation) developing the atmosphere of pluralism and recognition but institutionally and politically reproducing the premises for further capitalist profit accumulation. These are more or less already articulated leftist critical points of the UN’s contemporary ideological role and I was coming to the Conference in that kind of a mood. In other words if you choose socialism, UN is not your alley and you do not count on it. But if you choose to work from the inside believing that the articulation of a continuous critique as a part of the fight for the hegemony counts – as many NGOs choose to do – further should be kept in mind. During the 70ies and 80ies green politics/green NGOs tried to use UN as a tool for fighting against the exploitation of the planet, for sustainable future and green democracy. So, we could say that «the inside fight» has already been tested. But, as we can evidently see and witness no relevant alternative is done, on contrary greens even lost their original radicalism. My point is we cannot count on any institution or political-economical strategy for change if it is not fundamentally anti-capitalist and if it moves only from the existing framework of production relation. We should obviously historicise and contextualise UN. After the fall of Berlin wall and weakening of the Non–Aligned Movement we can witness the major loss of the UN multilateral significance. It became not only an institution represented by emptied diplomatic initiatives framed in a unilateral Western world-view but also the one with numerous failed peace missions. When the World Bank launches an initiative with a slogan «gender equality as smart economics» it precisely demonstrates how the system uses and comodifies social struggles for its reproduction, in this concrete case by promoting women’s empowerment as a resource for creating the surplus value. As stated by Adrianne Roberts in many of her analysis project of transnational business feminism is being developed by a coalition of states, financial institutions, the UN, corporations, NGOs and others who definitely sustain the neoliberalisation of society in its capitalist form. CSW is an opportunity to further affirm the macroeconomic framework that creates oppression and exploitation. In that spirit let us not forget the recently developed partnership between Coca Cola Company and UN Women to accelerate women’s economic empowerment. Is this feminist? Is this «promising a change for women and girls everywhere»? Is this green? No. It is called capitalist reproduction. Capitalism in its finest. There are also other out of scope approaches to the questions of sustainability and women. From a different feminist groups in Europe collaborating with union movements and green labour initiatives to socialist politics in Latin America. Being a part of RLS’s delegation of seven women whose task was to work together during the CSW I had a chance to meet Elisa Vega Sillo who is the former Director of the Bolivia’s Depatriarchalization Unit in the Vice Ministry of Decolonization. I wonder, maybe future shaping in a sustainable and actually women-empower manner should follow non-western trends based on anti-imperialism and anti-patriarchy. For a change «we» learn from «them», not the other way around. 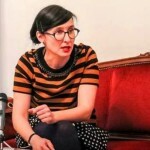 Ankica Cakardic is an assistant professor at the Department of Philosophy, University of Zagreb. She coordinates educational programmes at the Centre for Women’s Studies in Zagreb, is a member of The Organisation for Workers Initiative and Democratisation, Croatia, Women’s Front for Labour and Social Rights and the Feminist-Marxist reading group FemFront.